The restaurant industry is rife with fully employed chefs and waiters, busboys and dishwashers lacking health insurance; now suddenly food professionals may have an edge. Sue Lowden, a Republican challenging Harry Reid for his Nevada Senate seat, recently suggested bartering for health care saying "in the old days [patients] would bring a chicken to the doctor." And she's not the only one - Tennessee state representative Mike Bell suggested bartering with vegetables. If this is what Republicans are promising should they prove victorious in November's mid-term elections, Dan Barber and Alice Waters may be all but guaranteed the best health coverage in America. 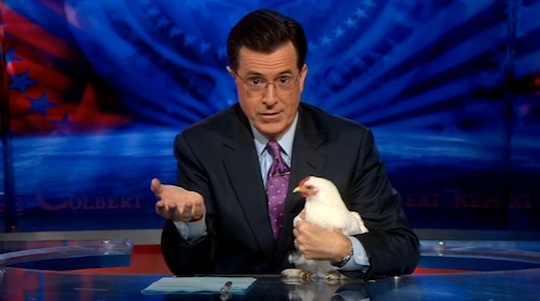 Even Stephen Colbert's on board, on last night's Colbert Report the host suggested "just go for where they sell live chickens, they go for about $8... and when a doctor wants to charge $40,000 to put a stent in your heart, offer him the chicken." Video below.